So today I am going to get to go visit with my family again. I hardly ever get to see them two times this close together, but Laura's still in town and we have a "girl's night" planned! Before heading out I decided to check on the strawberries again. It's a lost cause. I don't know what I'm doing and the brown rabbit keeps eating all of them. I've stood at the top of the stairs and looked out the window and watched hem stripping the plant clean. Sometimes he will just take one or two bites out of a big beautiful berry and then leave it there for the ants to finish off - what a nice guy. He even eats the hard green berries that won't be ripe for days. I keep thinking about last year when the plant was in a planter on the porch - all those strawberries. I had so many I made jam, froze some, and just gave some away. Not this year. I'd almost stopped checking... almost. Then I found these two little lovelies, and I do mean little. The small one is smaller than a fingernail, so don't let the picture fool you. 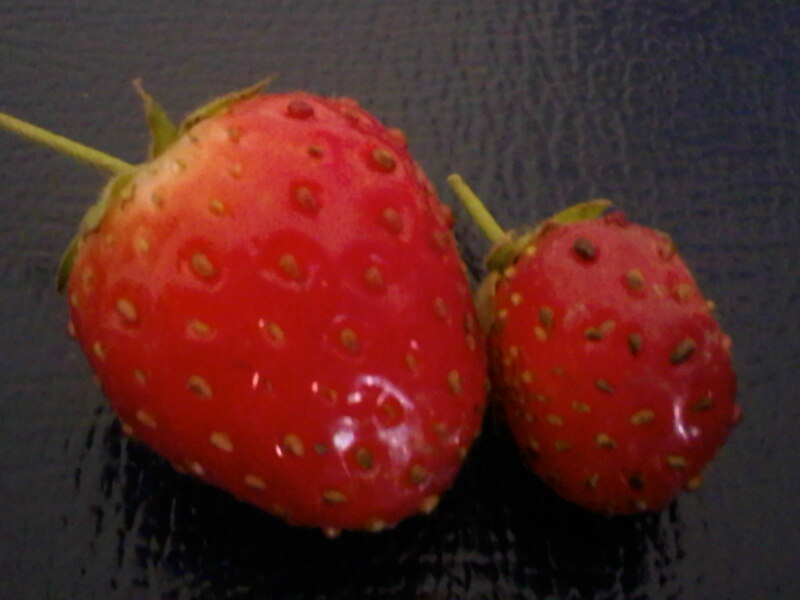 But I was able to pick two ripe strawberries, if nothing more than to just keep them away from that darn rabbit. And then it was time to leave for Mom's. I had to take a detour - and I hate detours. 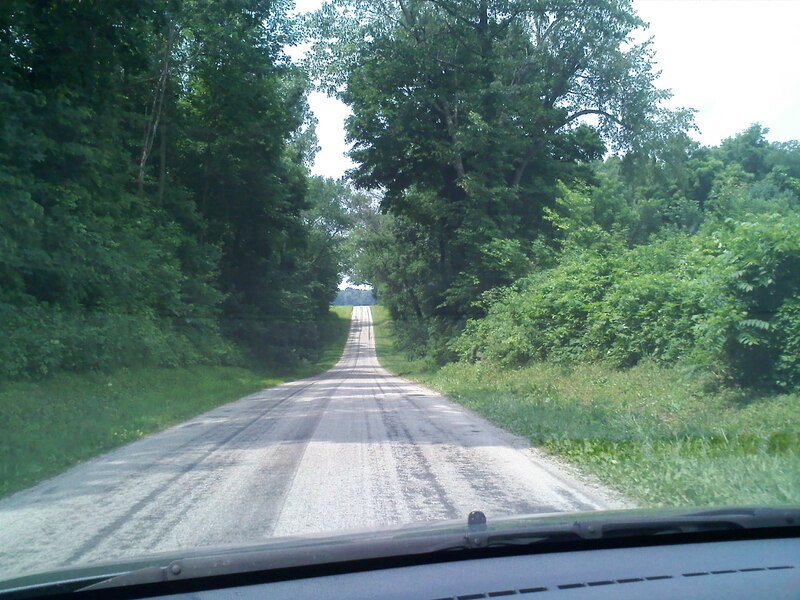 I am not a fan really of driving in unfamiliar places, especially in the middle of the country where winding one lane roads can quickly have you going in the opposite direction of your destination. But as I've said before driving adventures can hold amazing surprises... This road really is beautiful, even if I can't see what's on the other side of the hill. Are you kidding me? 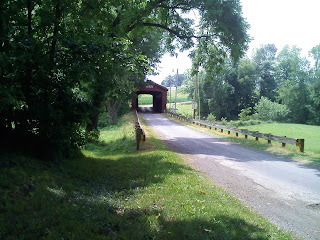 Is that a covered bridge? My detour through the middle of nowhere led to a covered bridge. 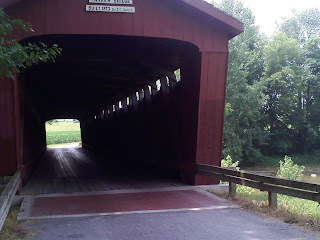 Parker Bridge built in 1873 by J.C. Davis - what an amazing adventure this turned out to be! It had been a completely beautiful day until I got close to Mom's. The closer I got the worse the clouds looked. 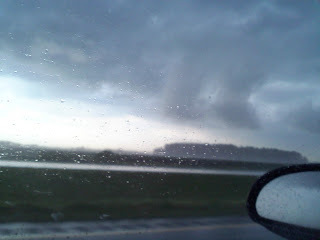 Then the sky opened up and the wind nearly took me off the road. I (and many others) had to pull off the highway to wait a bit until I had decent visibility and the wind died down a bit. We got reports later of tornadoes and semis being flipped, so I'm glad I didn't have to deal with the worst of it. Tonight was "Girl's Night". Mom, Laura, Kara, Christina, and I (Holly and Becky had last minute changes in plans and couldn't join us) ended up at Golden Corral in Ft. Wayne. 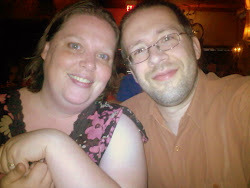 The food was so-so, the service was terrible, but the company was amazing - I wouldn't have changed a thing. We discovered we all felt the perfect vacation would be RVing across America (if someone else was going to foot the bill and we could do anything or go anywhere). I guess we're pretty down to Earth...an extravagant vacation might be nice, but we all really like spending time with our families and doing more normal things.